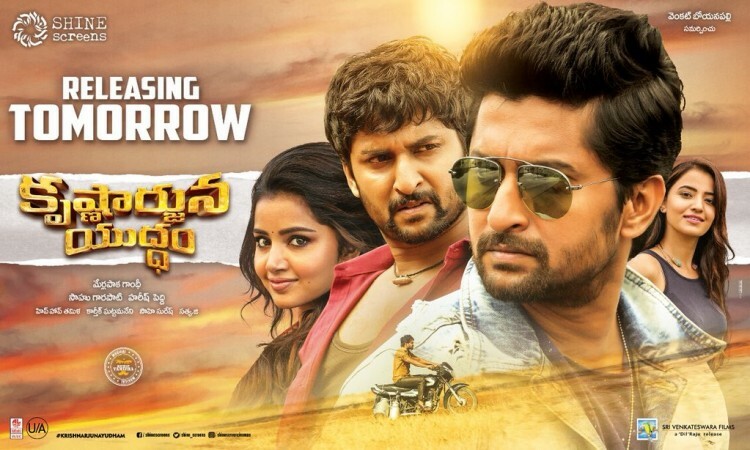 Nani's Krishnarjuna Yuddham has got mixed reviews and average ratings from the critics. They are not happy with director Merlapaka Gandhi's work. Krishnarjuna Yuddham (Yudham) has good performances by Nani and other lead actors and rich production values, but director Merlapaka Gandhi has faltered in the second half, which mars the beauty of the whole film, critics say. Krishnarjuna Yuddham revolves around the story of two guys — Krishna and Arjun, who hail from two different parts of the globe but appear the same. How they cross each other's paths when their girlfriends go missing forms the rest of the story. The critics say that Krishnarjuna Yuddham has an interesting plotline, but the director has failed in executing it. Merlapaka Gandhi manages to engage the viewers with some commercial ingredients like romance, comedy and songs but when they expect some interesting stuff to happen, he disappoints them with lengthy, dragging and predictable narration in the second half. Nani, who played dual roles, appears as a mass hero in Krishnarjuna Yuddham. His performance as Krishna is impressive. His Chittoor diction, comedy timing and chemistry with heroines Anupama and Ruksar are the highlights of the film. Music, picturization, punchlines and action choreography are attractions on the technical front, add the critics. Overall, Krishnarjuna Yuddham has received mixed reviews and an average of 2.7 out of 5 star ratings from the critics. Had the director not chosen a grave issue (revealing it would be a spoiler) and been content with a less ambitious backdrop for the second half, the film would have been far more convincing. For a Nani film, this one is too larger-than-life. Don't look for any rationale for two men ending up in a similar situation having to look alike. The dual role is pointless. The first half's laughs and the good technical values need a mention. For a debut production, Shine Screens has ensured very good production values, adding to the film's visual strength. Krishnarjuna Yuddham is the weakest movie from Nani in the recent times. The story and lack of freshness in the script have played the villain for the movie. The first half appears good but the second half altogether brings boredom for the audiences. There are fewer chances for the film to become a hit. Krishnarjuna Yuddham is a out and out Nani film from start to the end. Nani's stardom is in full flow as he becomes this mass hero who entertains you with his powerful performance. Impressive first half, good comedy and nice thrills are basic assets of this film. But the weak second half and a lengthy run time can put breaks on the free flow of the film. As it is the holiday season and keeping Nani's superb craze in mind, this film should satisfy those who are looking for a typical popcorn entertainer this holiday season. Nani who has been in an uninterrupted success streak might face headwinds with Krishnarjuna Yudham. Krishna (Nani) characterization throughout the film is good and decent comedy in first half is the USP of this film. However, second half lacks engaging value and songs in this half are not appealing. You may try this film if you like Nani's films.